We checked up on our hibernating snakes tonight, making sure that they were still alive and had clean water. All was well, if not necessarily happy. 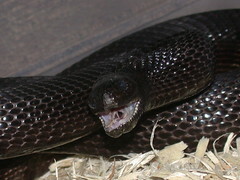 True to form, the female Pituophis were not pleased to be disturbed; they hissed constantly and struck occasionally. Of course I took the opportunity to get photos; it’s not every day you get confronted by an angry Pit. (And a good thing, too, because if they’re trying to intimidate, they’re really good at it.) See also this photo of Lilith in addition to the one at right. Par for the course: the gopher snake was angry at Florence and me in December 2001, and Lilith was loud and aggressive when she was brought out of hibernation in early 2003. Too bad it never occurs to me to record the sound.